I recently sat down with Ed Keller, one half of the book Face-to-Face with co-author, Brad Fay (does that make him "Face" or "Face"?) and one half of the firm, Keller-Fay. He's also the author of "The Influentials," which I found to be really landmark in terms of understanding influence, particularly from a word-of-mouth point of view. It's my first one and takes a little adjusting to the tech- and funding- biases which are commonplace in the startup world. Then there's the Michael Arrington - Ariana Huffington love affair / spat, which I think may have finally played itself out. Which is good. These events are pretty grueling for all parties concerned and a special accolade to the startups who have to be "on" constantly as they "man" their booths and work the floor/room throughout the day(s). In terms of themes, definitely encouraged to see quite a bit of activity in the audio category. As a podcasting "veteran", I am intrigued with the text-to-talk, next gen conference calls, audio apps etc. Another trend that is impossible to ignore is the photo/visual explosion and truly, brands need to have photo / visual POV's if not strategic approaches nowadays. Keep it simple (stupid) - the K.I.S.S. approach. This could also be called "know your audience". So many pitches dived into tech-speak and complex walkthroughs of product features versus the classic elevator pitch, the idea, the problem being solved, the consumer value proposition and corresponding benefit, points of differentiation etc. Use examples. Make it real. Or hypothetically real i.e. give me a sense of product in action and in the case of the Evol8tion business model and our brand clients, describe the perfect or your ideal brand activation. Let the product do the talking....demonstration is key. if you can do a quick scroll, flip, swish or slide in the time allotted, terrific! And here's the catch...don't rely on poor 3G or 4G or even wi-fi connections, which often times are the product of busy networks (think of where you are after all). Cached or offline demos aren't cheating. Do your homework in terms of the crowd and prospective audiences: partner, hire, investor, brand, press etc. Be prepared for the Big Fish. If you get a big bite, be ready to pounce and reel it in. Anticipate this as an exception versus norm, but certainly capitalize on the serendipity. Use the audience as your influencers. The Techcrunch audience is a pretty big deal. Just ask them! Seriously though...these people (we) are self-selected as the innovators/early adopters in the tech space certainly, or if not can probably get the message out. So treat them this way..and it all begins by them downloading your app. Comparisons are fine. If you don't make them, we will. We're a Path meets Open Table. Think Square meets Triangle. Oh you mean, like a cross between Twitter and Instagr.am for Newly Wed Cross-Dressers? I get it! The corollary of this is pushing back when we make the same comparisons or benchmarks. There are a ton more that came up today and maybe I'll include them in a follow up post. So do you agree/disagree with me? And more constructively, what tips would you offer up as either successful pitch-ers or caring pitch-ees? In this monthly debate, Mitch and I have a meaty conversation about one of the hottest and endless topics in the marketing world: how to correctly value, price and position ideas. It all stems from an article which Scott Montgomery wrote in Ad Age, where he attempted to debunk the myth about how long idea generation takes and on a parallel path, how ideas should be valued and compensated as such. We also open on a brief conversation about blogging, authentic voices and being re-certified. 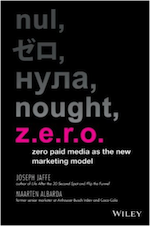 Tags: "Ad Age", "Advertising Agencies", "Agency Compensation", "Jaffe Juice", "Joseph Jaffe", "Marketing Podcast", "Mitch Joel", "Scott Montgomery", "Thought Leadership", "Twist Image"
I recently sat down with co-founder and CEO of eMarketer, Geoff Ramsey to talk about his new book, Digital Impact. In addition to being an industry veteran, he's also an all round nice guy and friend. It was really great to catch up with an "old timer" about the evolution of the new media space.